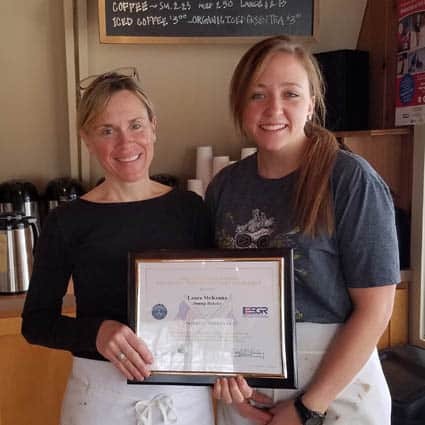 KILLINGTON—Laura McKenna, owner and operator of Sunup Bakery of Killington, was recently presented with the U.S. Department of Defense Employer Support of the Guard and Reserve (ESGR) Patriot Award. David Wheel, representing Vermont Employer Support of the Guard and Reserve, presented the award for the outstanding support that McKenna has given to her employee and citizen-service member, Taylor Curtis, of Rutland. Curtis is a Private First Class in the Vermont Army National Guard and serves as a combat engineer with Alpha Company of the 572 Brigade Engineer Battalion in Bradford. She works full-time for Sunup Bakery as an assistant baker. Curtis said she appreciated working for someone who had such great respect for our military. ESGR promotes, recognizes, and enhances civilian employer support of citizen service members. Laura McKenna, award recipient (L), and Taylor Curtis, the Vermont Army Guard soldier who requested the award for her boss.